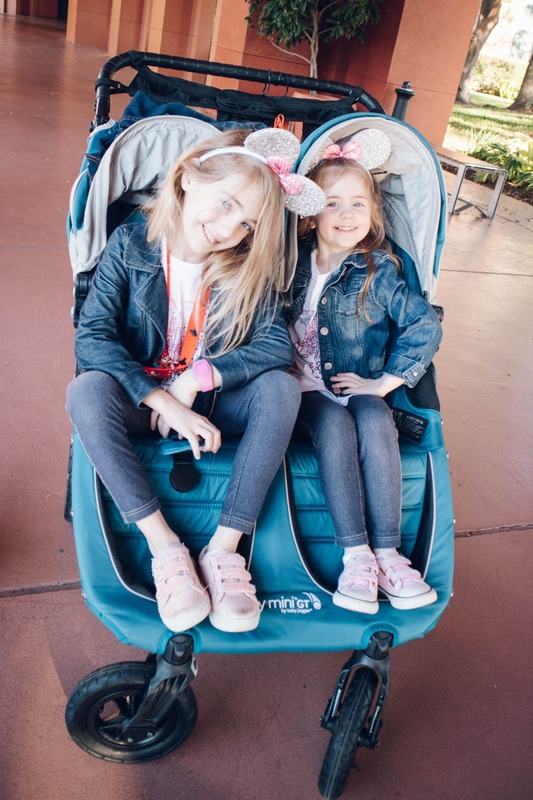 Shortly after we found out we were expecting our third baby in August, we decided it would be really fun to take our girls to Disney World for a family babymoon. We were thinking about going to Disney again in February but solidified our plans pretty quickly! Overall, it was an amazing trip and I’m so glad that we were able to experience this last big hurrah as a family of 4. For this trip recap, I thought it would be the most beneficial and fun to focus on the high points – favorite tips, how we planned, favorite meals, rides, etc. I figured that’d be way more fun than the whole “on day 1 we did this” sort of approach. If you didn’t catch it, I made a little travel video of our trip. So fun to make these memories together as a family. We are big Southwest Airlines lovers and were able to fly our whole family on Rapid Rewards points. I have the Southwest VISA credit card which really helps us rack up points and get free flights. That was a huge money saver! One other thing was we flew in Wednesday and out on Tuesday morning, which are usually lower fare days. The girls had an extra long weekend that week (they were off school Friday and Monday over President’s Day weekend), so they only missed 3 days of school. Heads up, President’s Day Weekend is a pretty busy weekend. We found that the Thursday and Friday before weren’t terrible, but Saturday and Sunday were extremely busy in the parks. I researched this for weeks on end and did a lot of price comparison. I knew I wanted 5 park days, and ideally park hoppers. What I ended up going with for our park tickets was buying through ParkSavers.com. I was able to save about $600 (crazy!) this way. I did have 2 media passes for one of our park days, as well. It was really easy and ParkSavers emailed me all of my ticket numbers. I was able to add all of our Disney accounts and link them to our magic bands, no problem. One other thing I highly suggest is going with a Disney planner – I highly recommend Stephanie from Traveling Ears. Disney travel planners are free to use and are really great at planning the whole experience for you. I would definitely recommend going this route if you’ve never been to Disney before. Disney can be super overwhelming. I would’ve probably used Stephanie to help me plan if I didn’t have a hotel lined up or if I was planning pretty far in advance. The further you plan out, the better deals you can find, and you have longer to pay it off. I wrote a whole post on this, so make sure to check it out! We stayed at the Walt Disney World Swan and Dolphin Resort and I couldn’t recommend it enough. We thoroughly enjoyed our stay there and thought it was the most amazing location we could ask for. Even though my girls have not been “stroller age” for quite some time, a stroller rental is a must. It kind of sounds ridiculous, but hear me out. Our average daily steps in Disney were 25,000. That’s about 10 miles a day! I don’t know about you, but our kids can’t really keep up with that. That’s where a stroller rental really comes in handy. No way we were going to drag one through the airport to only use it in the parks. We used Kingdom Strollers, and it is the most genius and convenient idea ever! You reserve your stroller online, and they drop the stroller off and pick it up from your hotel based on the times you tell them to do drop off and pick up. You don’t even need to be present! They will leave it with the bell stand. Stroller rentals in the parks are way more expensive! For a double stroller, you’ll pay $31 per day renting in the parks. Using Kingdom Strollers for 4-7 days is about $75-85 total. We had a Mini GT Double stroller and it fit our kids just fine. And remember, they’re 4 and 7. Not toddlers anymore. Haha. It was easy to push and maneuver around the parks (even though Greg did most of that, bless him). And guess what… no complaining of walking too much from our kids when they got to ride in the stroller. Disney is so stroller friendly – probably the most stroller friendly place we’ve ever been to. Lots of stroller parking areas near rides and attractions. Sometimes the kids couldn’t hang, so stroller naps were essential! Since we stayed at the Swan & Dolphin, getting to Epcot and Hollywood studios was a breeze. We were able to walk to both parks no problem, and the water taxis are also an option. Other than that, we used the Disney buses that picked up and dropped off at our resort. There is no need to rent a car while you’re there, unless you plan on doing other activities outside of Disney. Plan for lots of walking, like I previously mentioned. Comfortable shoes are key. We both actually really enjoyed all of the walking we got while being in Disney. It’s crazy to think we’ve walked more in Disney than we did in Europe. It is a huge time and money saver to do grocery delivery to your hotel room when you arrive. We have used Amazon Prime Now multiple times when we vacation, and we love it! We stock up on protein bars, bottled water (we buy a lot and throw into the stroller to bring into the parks), sunscreen (we also keep that in the stroller), fruit, breakfast items, and snacks. Highly suggest doing this! We did not have a dining plan while in Disney. Since we were planning the trip about 45 days out, it was hard to get dining reservations to a lot of the popular spots. Luckily, I scored a last-minute reservation to Be Our Guest the night before. My biggest tip is to stalk the Disney app constantly for reservations, because people are always cancelling at the last minute. The Beast is also present at dinner, and each guest gets the opportunity to meet and take a picture with him. I hear the Beast is only there at dinner time. My kids said it was the best dinner they ever have been to, and that alone to me was worth it. Their eyes lit up and they really enjoyed it. Another great sit-down meal was at Via Napoli in Epcot (pizza was delicious!). We didn’t have a reservation so I walked up and asked if they could seat us. We had to wait a max of 10 minutes. So, if there are no reservations available on the Disney app, try walking up and see what they say! Lastly, our favorite place to go in Disney Springs is Bongos Cuban Cafe. We actually ate there twice this trip. Haha! Cuban food is hard to come by in Texas and Florida always has great Such an amazing menu with fun ambiance. They have live music every night and will even get the kids involved in dancing and a conga line. Outside of that, we did a lot of counter-service meals and fun snacks around the parks. Our favorites are Dole Whip (pretty sure we had it 3 times), Joffrey’s coffee (iced coffee every afternoon was a great pick-me-up), and the French Bakery in Epcot. One night everyone was so exhausted and I had a pretty bad headache, and Greg walked over to Epcot (I’m telling you, our hotel was so close) and grabbed me the most delicious croissant sandwich and quiche of life. I suppose my biggest point here is don’t stress out too much over dining reservations, unless there are a few must-do hard-to-get experiences you want to do (like Be Our Guest, Cinderella’s Royal Table, Akerhaus, etc.). Lots of fun dining can still be had! I know a lot of people recommend purchasing the Memory Maker for $199 so you can get downloads of all of your vacation photos taken by the Disney Photo Pass people. We did not go that route, but I did hire a friend to come out to Magic Kingdom with us to help us with some gender reveal photos! I’ve known Faison for a while and she used to live here in Houston. She is an extremely talented photographer that will come to the parks and shoot with you for as long or as short as you want. She knows a lot of great spots within the parks to shoot, and has an artistic eye. She is so talented! I highly recommend going this route if you want some fun portraits for Christmas cards or something to cherish that looks a little more professional. Definitely get in touch with Faison if you’re going to Orlando and want a fabulous and talented photographer! Greg and I both agree that the Seven Dwarfs Mine Train is our favorite ride in Disney. Avatar Flight of Passage is also amazing! (Unfortunately zero Fast Passes were available for this ride when I was scheduling them 45 days out. You really need to schedule that one and Slinky Dog 60 days out. We didn’t get to ride either.) Test Track is also really fun but we were never able to get on it. I also love all of the thrill rides like Expedition Everest and Space Mountain, but that was a no go for me being pregnant. I asked my OB about rides and she told me I could do Mine Train (it’s my favorite ride and she takes her family to Disney). Our favorite slower rides are the Frozen ride in Epcot, Haunted Mansion, Soarin’ Around the World, Toy Story Mania, Buzz Lightyear (my kids are obsessed with both of those Toy Story rides), Pirates of the Caribbean, Kilimanjaro Safaris, Dumbo, and It’s a Small World. Honestly, my kids loved literally every ride we went on. Haha. Scheduling Fast Passes are an absolute must before going to the parks. Like I mentioned before, I scheduled all of ours 45 days out and still weren’t able to get on things like the Avatar ride or Slinky Dog Dash. I kept checking the app over and over to see if there were any spots that opened up, and nada. So, if you can, schedule those 60 days in advance. One thing I’d also recommend doing is try to schedule your 3 Fast Passes in the morning. Once you visit your 3 scheduled attractions, you can get back on the app and schedule one more at a time. This was particularly helpful in avoiding lines. Our first day in Magic Kingdom we were able to ride so many rides by scheduling Fast Pass after Fast Pass. As soon as we tapped in on the Fast Pass line, I’d immediately whip out my phone and see what we could get next. Like I mentioned, you will be walking a lot. Comfort is key! It’s also warm most days out of the year, and you’re in Florida, so the sun may feel a little more intense to you. Sunscreen is a must every day of the year! Every day we wore t-shirts, tennis shoes, and shorts or comfy pants. Of course, we paired them with a bunch of fun Minnie ears. I’m planning a whole separate post about our tees and outfits, since I did get a lot of questions about that! I did another post last year all about What to Wear in Disney World + Packing Tips, so definitely check that out if you want more help in that department. Another question I got a lot on IG stories was about all of our ears. I made a lot of them, actually! If you go to that blog post, I go into details on how I did that. I’m not a crafty person at all, so if I can do it so can you! I also got a lot of cheap ones off Amazon. One thing I do want to mention again is we cannot live without these space saver bags. I honestly don’t know how to travel without them anymore. They not only help you organize your packing, but they compress down nicely, leaving you lots of room in your suitcase. If you listen to one piece of advice from this blog post, let it be this. Haha. When is the Perfect Age to Go to Disney World? I really thought we’d be waiting a while before we took our kids to Disney – like once Caroline turned at least five. However, I really think her going at age 3 last year was awesome. I do believe there really is no right or wrong answer here. Disney is so family-friendly and for all ages. Maybe they won’t remember seeing the castle for the first time, but you’ll remember it. We are open to the idea of taking a baby plus our two older girls to Disney again, but there are no immediate plans. So, I don’t think an age is “too young” or “too old” to experience the fun. I’m so happy we were able to do this together as a family of four before baby brother arrives. Disney is a marathon. You’ll be exhausted by the end of your trip, but you will love every moment of it and you’ll be so happy you got to experience it together as a family. I can’t wait to go back again as a family of five!